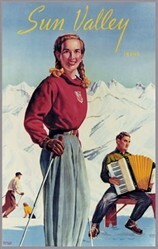 Beautiful poster by Ray Atkeson celebrates Wildcat ski run at Alta, Utah in 1957. 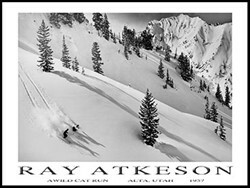 Naturally the image highlights Utah’s claim that it has “The Greatest Snow on Earth!” or others boast that Alta has “The Greatest Powder Skiing on Earth!” Size 18 x 24 inches. 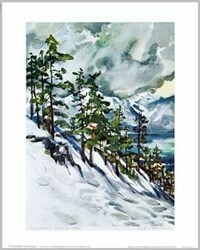 Ray Atkeson was taking pictures and climbing mountains as early as 1933. With a terrific eye for composition and beauty rendered in the gray tones of black-and-white fine art printing, he captured sublime photos primarily throughout the Northwest United States. 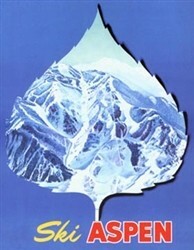 Atkeson received many honors for his work, including Oregon’s Photographer Laureate and induction into the Photographic Hall of Fame. Our posters are an affordable way to enjoy Atkeson’s amazing images.